Drawing Down the Spirits presents an insider’s view of the inner workings, sacred traditions, and prevalence of spirit possession existing in our modern world. Spirit possession is an integral part of shamanism as well as many neo-pagan forms of worship that draw down deities or invite spirit possession. However, spirit possession is not for the unprepared. In Drawing Down the Spirits, Kenaz Filan and Raven Kaldera, both initiated and experienced in shamanic and Vodou traditions, present the practical guidance needed to participate in ritual possession. At sixteen, it began, and I didn’t know what to call it. I didn’t know anything, and I told her. She informed me that I had called her by a name that was known only to herself. I had to come up with some kind of explanation, so I said, “Well, maybe I picked it up from your thoughts. Don’t worry, whatever it was, it’s gone. I don’t remember it. It went right through me.” Apparently I also told her to do something, but she didn’t say what, and I didn’t ask. Even then, I knew that hearing these things was not for me. But I also knew that I hadn’t picked anything up from her thoughts. That was a hastily crafted lie, spoken for both our comfort. That hadn’t been me who had said those things, and I had no idea what had been spoken. Another presence had moved into my body and shoved me aside, and I could only flounder as it used me and moved on. It occurred about every four to six months, just often enough to make me doubt my sanity. I wondered if I’d somehow developed multiple personalities, and I searched my head for them--and found nothing. I wrote notes to myself, pleading with myself, telling whoever was in there to at least write something back, but there didn’t seem to be anyone in my head but me. After a while, I decided that this had to be external, because it felt so very . . . inhuman. Bigger than me, much bigger. I was like a cowering child next to these Presences--and yes, there was more than one of them, which seemed even more worrisome. I started watching Them, observing in the moment before I “went away,” psychically “sniffing” the scent when I came back--and I figured out that one of them, anyway, was the goddess who had been talking to me off and on since my childhood. I didn’t know Her name at the time, but I knew that She was a Death, and that She had some kind of a strong connection to me. Nailing this fact down was both a relief and a greater terror--my body was being borrowed by deities, but why? How? I joined a local Wiccan coven, but the high priestess was young and unsure of what to do about my situation. At first she told me that it was just “drawing down,” although she’d never heard of it happening spontaneously. Then a visiting Pagan from another group mentioned Vodou folk and that they do spirit possession as a matter of course. My head jerked up, and I felt my high priestess’s eyes on me across the room. I didn’t know where to go in order to find any Vodou people, so the information didn’t seem all that useful. However, a week later that visiting Pagan called me up and gave me the contact for an Umbanda House about an hour away from me. At seventeen, I ran away from my parents’ house and began to live on my own, but it was still years before I was able to follow up on that contact. How do you say to a group of colorfully dressed strangers, “I think that gods are borrowing my body, and how do I make it stop?” Because it hadn’t stopped; in fact, it had become more frequent. It felt like a violation, and control freak that I was, it frightened and shamed me. To my surprise, the House Mama was entirely sympathetic, and she turned me over to her assistants to be taught the practicalities of god possession. Drinking salt water, cold water on the back of the neck, nonrhythmic activities--these could put off possessions for a while. The real issue, though, she cautioned me, was that I had to make proper alliances with the spirits who wanted to ride me. It was the first time that I heard the terms horse and ridden . . . and discovered that this gift/curse that had chosen me could not be unchosen. Most Western spiritual traditions don’t know what to think about the idea of being possessed by a deity, but for the most part it makes them uncomfortable. Possession was something done by evil spirits, like in The Exorcist, right? If they had some knowledge of Afro-Caribbean religious practices, they might associate it with those traditions, but even that seemed rather far-fetched and alien to a modern Western spiritual tradition. The actual deliberate practice of spirit possession for ritual purposes veered between being discouraged and being disbelieved entirely. And so it was pushed aside into oblivion . . . except that people kept getting possessed, sometimes by entities who claimed to be the gods that those people claimed to be worshipping. possession is growing slowly but steadily, sometimes to the dismay of community leaders who are not sure how to handle the phenomenon safely and sensitively. Raven Kaldera is a Northern Tradition Pagan shaman who has been a practicing astrologer since 1984 and a Pagan since 1986. The author of Northern Tradition for the Solitary Practitioner and MythAstrology and coauthor, with Kenaz Filan, of Drawing Down the Spirits, Kaldera lives in Hubbardston, Massachusetts. "Are you ready to have your mind blown? Seriously, are you looking for a book that will force you to confront and/or reevaluate your thoughts on the very prospect of God or Gods themselves? . . . Hidden within this informative, straight forward text, is a philosophical discourse that is fascinating. Once you open this book, you'll find it hard to put down." 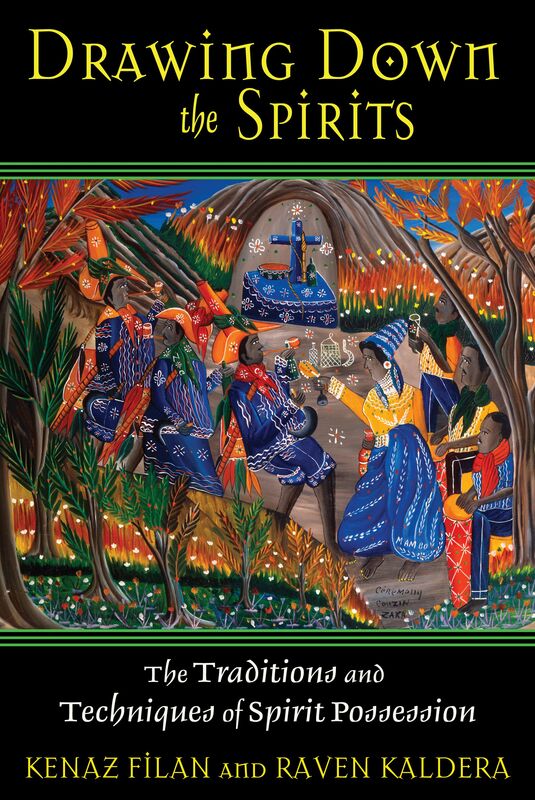 "The authors are initiated and experienced in Shamanic and Vodou traditions and here provide keys to understanding possession and spirit agendas." "This book is a must for anyone considering experimenting with possession or who may have been possessed. As the authors state, you are not crazy if you are possessed. . . . an excellent overview on spirit possession. For the serious student, there are numerous references for future reading, but the most important message of this book is the seriousness of possession." ". . . this rich, deep and extensive book is the work of two experienced, thoughtful and intelligent travelers who grace us with their map of the land of spirit possession with intelligence, wit and humility. They ask that we always treat the spirits with respect, learn their ways, original culture, expectations and taboos, and take responsibility for our part in the relationship - not bad advice for any relationship."